In an article posted earlier today, we provided the video of David Sokol’s CNBC appearance along with commentary regarding his statements. As part of that article, we raised the issue of Mr. Sokol’s statements on CNBC contradicting the Lubrizol proxy statement account of the development of the transaction with specific reference to Mr. Sokol’s characterization of his discussions with bankers at Citigroup on December 13, 2010. Specifically, Mr. Sokol suggests that he did not explicitly express interest on behalf of Berkshire when speaking with Citi. This issue is extremely serious, has received little media attention, and deserves more extended consideration. We have prepared the following partial transcript of the CNBC interview based on reviewing the video. The partial transcript contains two key sections of the appearance and we provide the approximate starting time for readers who wish to listen for themselves. We first present the partial transcript and then compare it to the information in Lubrizol’s proxy. Joe Kernan: No, that’s not true? It’s not that Berkshire might be interested in acquiring Lubrizol? David Sokol: We had a broad conversation where one of the bankers who was in the meeting said he knew the CEO of Lubrizol and I said gee, if you know him well enough to set up a meeting that would be great, I would love to meet him. Joe Kernan: But not about Berkshire buying Lubrizol at that point? David Sokol: Well, we didn’t even … I mean he would certainly have inferred that since I worked for Berkshire, um, you know, that you know that Berkshire would have an interest. Joe Kernan: Although you didn’t, you said already, you didn’t usually decide what Berkshire was going to buy? David Sokol: I can’t decide. I have no … but I work for Berkshire so I’m just saying that certainly would … I think he would have assumed that my interest was in some way for Berkshire. Becky Quick: Some people have raised the question on timing around that. If it was a stake that you had held for, let’s say, six months, a year, two years … we’ve had other people on who’ve said that wouldn’t concern them at all. The idea that this came in such close connection with the idea being brought to Berkshire, to Warren’s attention, that’s where they have a conflict. Do you understand that that could give the appearance of impropriety? David Sokol: I can understand the appearance issue and that’s why we made it public in the press release is that we want people to know there is nothing there. The reality is I have no control over a deal ever happening. So to … the alternative would be for me to only invest my family assets and if I think there’s a good deal for Berkshire not give it to them. I mean, that to me makes no sense. It’s ultimately their decision. Certainly if I was going to be the person that was going to get to make the decision whether or not we should buy this company or not or if I was even going to get to vote on it that’s a completely different scenario. But I’m trying to invest my family’s capital and if I see a company that I think is interesting and potentially undervalued to not mention it to Warren to me seems inappropriate. 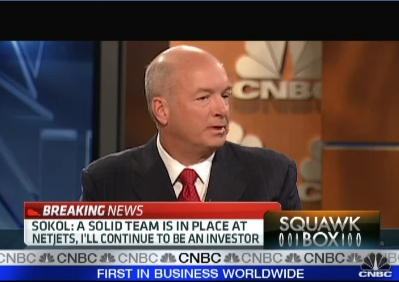 Mr. Sokol’s statements to CNBC are clearly intended to present himself as primarily a private investor looking for appropriate investments for his family’s capital. Only as a secondary consideration does he suggest that candidates might be brought to Warren Buffett’s attention. Furthermore, Mr. Sokol claims that Citi would have had to infer that his request to meet Lubrizol’s CEO might be related to Berkshire Hathaway implying that he did not directly state his role as an agent for Berkshire. On December 13, 2010, Mr. Sokol and Citi met to discuss the list of companies. During the course of the meeting, Mr. Sokol said that the only company on Citi’s list that he found interesting was Lubrizol. When Mr. Sokol learned from Citi’s representatives that Citi had an investment banking relationship with Lubrizol and its Chairman, President and Chief Executive Officer, Mr. James L. Hambrick, he asked one of the Citi representatives to inform Mr. Hambrick that he was interested in speaking with him and discussing Berkshire Hathaway and Lubrizol [emphasis added], if Mr. Hambrick were available. Mr. Sokol also advised Citi that Berkshire Hathaway does not engage in hostile transactions [emphasis added], and that Mr. Hambrick should understand that if they met and nothing came of the meeting, their meeting would remain confidential. It is impossible to square Mr. Sokol’s depiction of the events of December 13 with the events described in the Lubrizol proxy where it is clearly stated that Mr. Sokol not only represented his interest to be on behalf of Berkshire but also went as far as to provide reassurances regarding Berkshire not engaging in hostile actions. Either Mr. Sokol’s account of the events of December 13 described to CNBC this morning were not accurate or Lubrizol’s proxy statement contains inaccurate information. Both accounts of the events of December 13 cannot be correct simultaneously. Is this a smoking gun from a legal perspective? Probably not given the opinions of numerous legal experts who have stated that Mr. Sokol’s actions probably do not rise to the level of insider trading. Our concern isn’t related to the law but to Mr. Sokol’s attitude toward his role at Berkshire. It seems like he considered himself a private investor first and an employee of Berkshire second. He was out to find investments for his family’s capital first and if something worked out for Berkshire as well, that was a nice side benefit. At numerous points in the video, Mr. Sokol refers to Berkshire as “they” or “that would be their decision”, making it seem as if he did not realize that he was Berkshire’s representative even if he did not have final decision making authority. It is clear that Mr. Sokol was representing himself to Citi as an agent of Berkshire according to the account provided by the Lubrizol proxy. At a minimum, even if Mr. Sokol’s account of events is accurate, he was relying on an inference related to his association with Berkshire and Warren Buffett to gain access that he would never enjoy as a private investor. This fact alone is enough to raise serious ethical concerns even if the matter does not rise to the level of a legal violation. December 14: Sokol first bought 2,300 shares of Lubrizol, Buffett said in his letter. We also now know that Sokol attempted to buy much more Lubrizol stock on December 14, but was only able to get 2300 shares at his limit price. Based on the above information, the more I think about it the more I realize that what Sokol did was *obviously* unethical. And what’s starting to disturb me is that Buffett did not react that way. Seems like Buffett has convinced himself that what Sokol did “looks bad” but that it wasn’t unethical, and I find that disturbing. What do you think? I don’t see how it is possible to infer that Warren Buffett did not find this pattern disturbing. He never says that in the press release and is silent on the question of whether Sokol’s actions were ethical, saying only that they were not “unlawful” — an opinion now shared by every legal expert I have heard speak on the subject. Mr. Buffett and Berkshire shareholders are the victims here — we had a highly trusted individual present deals to Berkshire in which he had an obvious conflict of interest. Sokol’s actions, *by his own admission* were designed to ensure the well being of himself and his family FIRST and to consider Berkshire only SECOND, if at all. Here’s a man paid well into the eight figures for his work at Berkshire each year who cannot seem to understand why it is a problem that he was out looking for investments for his family while acting as a representative for Berkshire, using his association with Berkshire and relationship with Warren Buffett when convenient while disregarding his duty to put Berkshire first when attractive opportunities came up. I cannot believe that David Sokol is obtuse enough to not see the obvious conflicts of interest. They go well beyond the mere profit he stood to make if Berkshire bid for Lubrizol at a hefty control premium. For example, during this timeframe, Berkshire had a potential deal in the works for MidAmerican – a deal that Mr. Buffett preferred. Sokol was in charge of that deal. Did his position in Lubrizol – a potential alternative investment for Berkshire – enter into his thinking when negotiating that deal for MidAmerican? I have NO IDEA but a few days ago, the thought of such a conflict wouldn’t have crossed my mind. Today, it does. The only criticism of Mr. Buffett that seems at all fair is why he did not probe further when Sokol told him that he “owned shares”. I cannot read minds. But think about how Warren Buffett instinctively thinks when the word “ownership” comes up. He must have thought that Sokol had a longstanding ownership interest in Lubrizol, not that he made a quick trade in December and purchased $10m worth of stock a mere week before pitching the idea. Maybe he should have still asked Sokol. But as I’ve said elsewhere, Berkshire’s top management has always worked under the principle of a “seamless web of deserved trust”. I have no doubt that this extended to David Sokol. Sokol violated that trust grossly and we now have this mess. The question is whether Berkshire’s “web of deserved trust” philosophy is appropriate or can be sustained in a post-Buffett Berkshire. I hope it can be – it is a unique model and something that makes Berkshire unlike other companies. But maybe Sokol has ruined this. I don’t know whether this approach can now survive Sarbox 404 scrutiny. If not, it’s just another wound David Sokol has imposed on Berkshire – balanced against his many (undisputed) accomplishments over the past decade that have enriched Berkshire shareholders. “He must have thought that Sokol had a longstanding ownership interest in Lubrizol, not that he made a quick trade in December and purchased $10m worth of stock a mere week before pitching the idea. Maybe he should have still asked Sokol”. I agree, but I think what Sokol did is even worse than what you wrote. The “quick trade” in December only happened because he was unable to get a significant amount of stock from his initial limit order. One of the really damning things here, in my opinion, is that Sokol first purchased his stock *the day after* the Citigroup meeting where he communicated an interest in Lubrizol as a possible Berkshire acquisition and set up that meeting with the Lubrizol CEO. I continue to find this behavior extremely odd. Out of the 5,598 listed equities in the United States, was Lubrizol *so* compelling that Sokol couldn’t bring himself to exclude this one stock from his investment menu? If that description is accurate, then Buffett viewed Sokol’s actions as a mere “appearance problem for Berkshire”. I think it was worse than an “appearance problem” – I think Sokol’s actions were clearly unethical. Hard to know what Buffett really thinks, but at least on the surface he appears to be defending Sokol’s actions. It’s hard to know exactly what was discussed between Buffett & Munger based on the accounts of a third party. I bet Munger was absolutely furious when he learned of this and it would not surprise me if he spoke to Sokol himself while Buffett was in Asia. If this happened, it would explain why Sokol resigned and would be consistent with Buffett’s statement saying that he had not asked Sokol to resign. It would also explain the low class and absurd comparison Sokol made between his trade in LZ and Charlie Munger’s longstanding ownership interest in BYD. Sokol probably was trying to even the score. My educated guess is that after Buffett and Munger brought Sokol’s trading in Lubrizol to the attention of the board, then one of the other board members had a discussion with David Sokol about it (urging that a resignation would be in everyone’s best interest). The most likely person to talk to him would have been Walter Scott (because of their close relatonship), although it could have been Tom Murphy (Chairman of the Audit Committee) or another independent board member. It is unlikely that no one on the board communicated with Sokol directly or through an intermediary prior to his resignation. Jason Zweig wrote a great article (to appear in tomorrow’s WSJ Saturday edition) on how people fool themselves into thinking that conflicts of interest won’t affect them. Even though these same people believe conflicts of interest will affect the judgment of others. I believe Sokol exhibited this same hubris and that’s how he rationalized his act of self dealing in Lubrizol’s stock. If a $10M investment in a stock about to be acquired by your employer isn’t a conflict of interest, then I do not know what is. ravi, how do you defend buffett’s decision to keep sokol at berkshire until apr 21? buffett did not talk about this in the press release. the departure date was hidden in an 8-k. I have no insight into this although I noticed the 8K when it was filed. Three possibilities: (1) Called for in employment contract; (2) Required to have him hand over operational duties at the three subsidiaries where he was Chairman; (3) He’s on some sort of administrative leave and not actively involved. The brief mention in the FT isn’t sufficient to conclude that we know Charlie Munger’s full opinion on this issue. I assume that both Buffett and Munger will be speaking about this at the annual meeting given what has transpired over the past week. In addition, the board is investigating the situation and presumably will issue a report as well. I think the media needs to slow down and wait to hear complete answers at the annual meeting. Sokol likely violated the company’s code of conduct and has since resigned. He is flawed like most people and probably acted selfishly and showed poor judgment. He did not commit a heinous crime, so there is no need to villify him. Many members of the media are salivating at the mouth to knock a noble person like Buffett onto the ground. Balthasar Gracian had a name for these types of people “worthless”. If Citi were to bill someone for their research would it have been Sokol and family or Berkshire? Or along the same lines, who paid for Sokol’s NetJet trip to New York for that meeting? Did he pay personally or did Berkshire or a Berkshire subsidiary pay? An updated LZ proxy was filed yesterday and it had the same account of the meetings on December 13. The inconsistency remains and needs to be clarified.